WASHINGTON — Even as Congress nears votes on a bipartisan deal that could yield two years of budget peace, an Associated Press-GfK poll has found that Republicans back home prefer a far more confrontational approach with President Barack Obama. In a survey this month, 73 percent of Republicans said they think lawmakers should extend the government’s authority to borrow to pay bills only if Obama accepts substantial spending cuts. Virtually the same proportion of Republicans, 74 percent, say it would be worth a different confrontation — a federal shutdown — to force spending reductions. Top congressional Republicans have reached opposite conclusions on both fronts. They and top Democrats were urging rank-and-file lawmakers of both parties on Tuesday to support a pact, completed hours earlier, aimed at boosting the debt limit and financing federal agencies for the next two years. A House vote could come as early as Wednesday. The poll also shows little overall support for forcing a shutdown over GOP goals like halting federal payments to Planned Parenthood, repealing Obama’s health care overhaul or blocking a nuclear deal with Iran. That public reluctance, plus lacking the votes to override Obama vetoes, helped handcuff Republicans from pursuing combative budget showdowns with the president. Failure to extend the government’s ability to borrow money by early November could spark a destabilizing, first-ever federal default. A partial government shutdown, which the agreement would avert, would begin if lawmakers don’t approve money by Dec. 11 to keep agencies running. With next year’s presidential and congressional elections creeping closer, Republican leaders want to avoid a headline-grabbing shutdown or lapse of federal borrowing authority for fear of labeling their party as unable to govern and alienating voters. The AP-GfK poll highlights that many GOP voters prefer a more aggressive stance, mirroring the complaints of the House Freedom Caucus and other hardline conservatives in Congress who helped force the resignation of House Speaker John Boehner, R-Ohio. Fifty-eight percent of Democrats surveyed said Congress should increase the debt limit first and negotiate separately over spending. A surprisingly significant minority of Democrats, 44 percent, were willing to close government to force spending cuts. People overall backed conditioning a higher debt limit on spending cuts by 50 percent to 35 percent. Another 11 percent opposed boosting the ceiling under any circumstances. Since winning control of the House in 2011, Republicans have frequently insisted on spending cuts as the trade-off for boosting the borrowing ceiling. But that year is the last time they won those demands in a debt limit showdown with Obama. 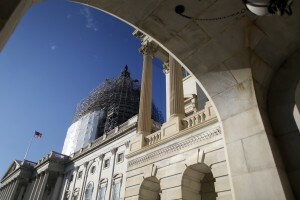 Americans in the AP-GfK poll also said spending cuts would be worth a government shutdown by 56 percent to 40 percent. Roughly half of independents supported linking spending cuts to both a debt ceiling increase and to keeping the government open. Only 1 in 4 overall backed forcing a shutdown to block Planned Parenthood’s money, including fewer than half of Republicans. The GOP has unsuccessfully tried halting the group’s federal payments because of abortions and fetal tissue donations it performs. Only around a third of people would back a shutdown over annulling Obama’s health law and around 4 in 10 would support the tactic to derail the nuclear pact with Iran. Those sentiments contrasted sharply with the more aggressive views of tea party supporters, whose opinions influence some congressional Republicans. Among that conservative group, support for a shutdown over Planned Parenthood, the health care law, the Iran deal and cutting federal spending ran between 60 percent and 90 percent. Tea party backers represent around one-fifth of those in the AP-GfK poll. The survey highlights public indecision over extending the debt ceiling, which lets the government borrow money to pay costs that it has already incurred. By a small margin, more people oppose than support raising the limit while the bulk — more than 4 in 10 — are neutral. The AP-GfK Poll of 1,027 adults was conducted online Oct. 15 to 19. The sample was drawn from GfK’s probability-based KnowledgePanel, which is designed to be representative of the U.S. population. The margin of sampling error for all respondents is plus or minus 3.3 percentage points. Respondents were selected randomly using telephone or mail survey methods and interviewed online. People selected for KnowledgePanel without Internet access were provided it for free.